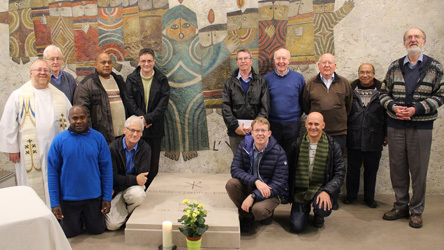 General Councils of the Marist Family's professed branches came together recently at Nemi near Rome, for their annual meeting (Mar 23-25). 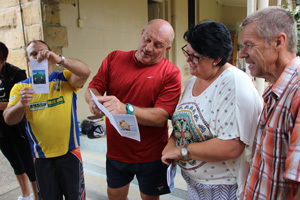 The international leadership teams represent the Marist Sisters, Marist Missionary Sisters, Marist Brothers and Marist Fathers. 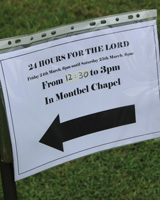 Members of Holy Name of Mary parish, Hunters Hill, took turns in spending prayerful time before the Blessed Sacrament for twenty-four hours over Mar 24-25. 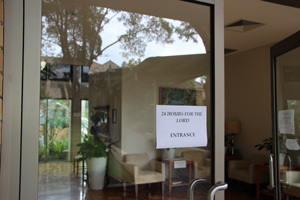 Alas, the popularity of their beautiful parish church for weddings and baptisms meant they needed to 'pop in next door' and use the chapel of the Marist aged care centre, 'Montbel', for a few hours on Saturday afternoon. Welcome guests. Fr Jim Carty SM has joined the ranks of those calling for serious action on climate change. As part of 'Pacific Climate Watch's' social media campaign towards a congregational voice on climate change and the Pacific Islands, Fr Jim braved Sydney's recent Big Wet to record his statement... soggy, but sincere. He says: 'Climate change is on my mind, so I stood in yesterday's thunderstorm- the rain blurred the sign and soaked the holder. It reads: 'CLIMATE CHANGE IS NOT A HOAX. ITS REAL. WE NEED ACTION NOW'. 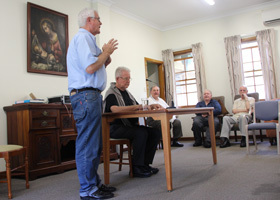 Members of the Maryvale-Montbel community, Hunters Hill, were joined on Mar 16 by Marists from other parts of Sydney to hear Fr Justin Taylor SM speak about his work on the recently-completed biography of Jean-Claude Colin. Whilst in Sydney Fr Justin examined pictorial resources to provide visual enhancement for the Marist Founder's definitive biography. The book is likely to be published in 2018. 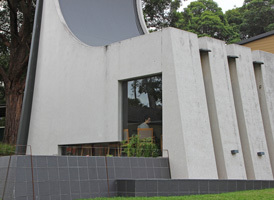 Fr Justin returned to Auckland, NZ, on Mar 18 to resume pre-publication work. 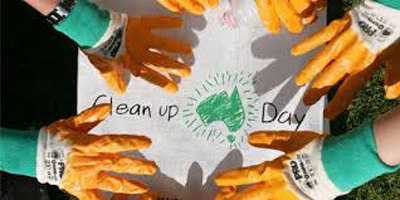 After their five-day gathering at Villa Maria, Hunters Hill, participants from Marist-founded schools were unanimous about their positive experience. 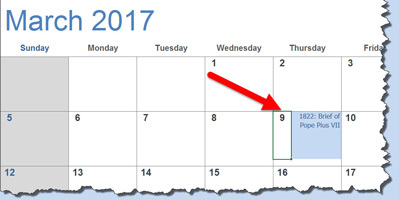 The next immersion will be held in late July. 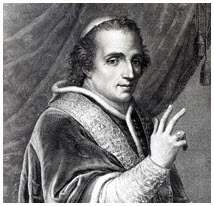 On Mar 09, 1822, a short but important letter was sent from Rome by Pope Pius VII to the aspiring members of the Society of Mary in Cerdon, France. Known as a 'Brief of Praise', the letter gave initial encouragement to the Marist project, outlining the further steps necessary before official approval could be given. It was signed on behalf of the Pope by Monsignor (later Cardinal) Raphael Mazio, secretary of the 'Latin Letters' whence such documents were sent. 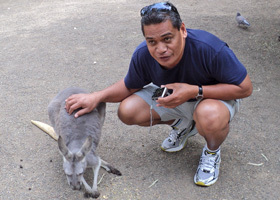 The latest issue of the Marist Laity Australia newsletter includes a comprehensive and colourful report on their immersion experience in the Philippines. 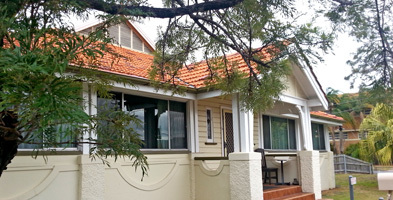 New members have joined the community of the Marist House of Welcome, 'Bethany', Rosalie, Brisbane. 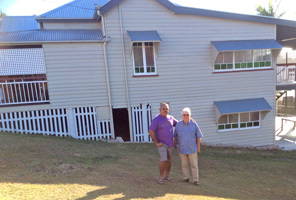 An adjacent house accommodates the newcomers, Frs John Worthington and Ekuasi Manu. 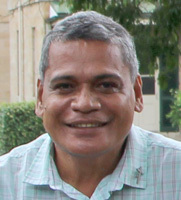 Fr Ekuasi, a Tongan-Fijian Marist, has just completed nine years as principal of St John's school, Cawaci, Fiji, and is now commencing a M.Ed. (Leadership) through ACU in Brisbane. 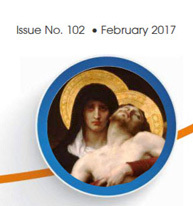 Community leader, Fr Gerard Hall SM, adds: " 'Bethany' offers a welcome not only to visiting Marists from our region but to any young person who may wish to come and stay for a while to discern a Marist vocation." 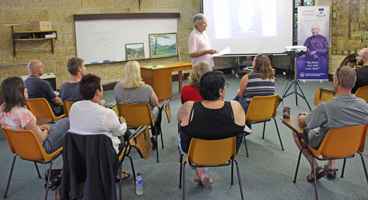 On Mar 05 the latest in the series of Marist Charism & Culture workshops commenced at Villa Maria, Hunters Hill. 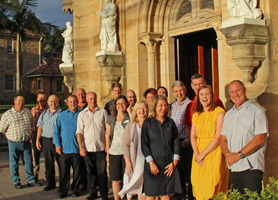 The fifteen participants are from Marist-founded schools: St John's College, Woodlawn, NSW, Holy Spirit College, Bellambi, NSW, and Marist Regional College, Burnie, Tas. The four-day workshop will include input from a range of Marist speakers as well as historical tours and interviews with senior Marists. 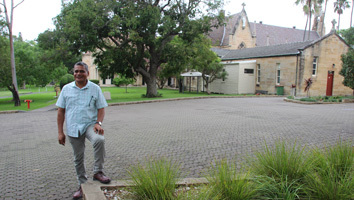 Tongan Marist, Fr Wesley Manu SM, is in Sydney for some days en route to France and the Colinian Period of Renewal (see below) now commencing at La Neylière. 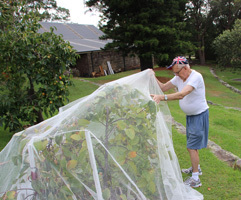 Fr Wesley is no stranger to Sydney and Villa Maria where he participated in the 2011 'Spirituality and Lifestyle' program. 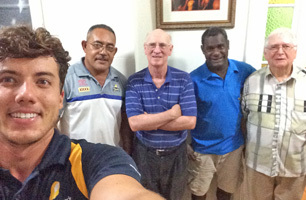 Recently based in Hahela, Bougainville, Fr Wesley caught up with Pacific veteran, Fr Kevin Kerley OAM, during his transit visit. Maloleilei, Fr Wesley! Above: Fr Wesley Manu / ... with Fr Kevin Kerley. 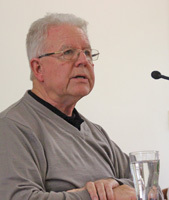 Below: Fr Wesley at Villa Maria | Flashback to 'S&L' days in 2011. 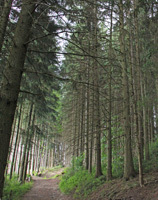 "On Ash Wednesday ten Marists gathered at La Neylière to begin the Colinian Period of Renewal. 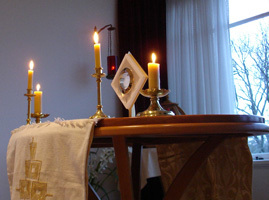 "The group gathered in the Oratory for a short liturgy. We began with a message from the Superior General and then the names of the participants were called. Each of the group was presented with a copy of the 1872 SM constitutions by Tony Kennedy, the director of the program. The Marist community at La Neylière make up the rest of the team who will take up signiﬁcant roles throughout the period. For the next ﬁve months the group will reﬂect on the Spiritual life through prayer, silence, presentations, accompaniment and reading. We will have the opportunity to visit the places of Marist origins and reﬂect on the life of Fr Colin and the constitutions: both old and new. Listening to the diﬀerent experiences and stories from each of the group members will be a key component as we share life together as Marists. Thank you to all those who have oﬀered to pray for us." Australian Marist seminarian, Hayden Kennedy, is settling into his new home in New Zealand. Hayden has joined the formation community at Hopetoun St, Auckland, with two other young men, including newly-professed namesake, Hayden Powich. 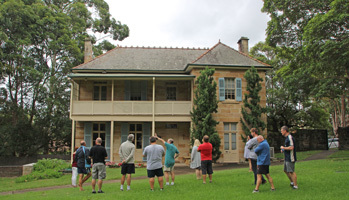 Hayden (Aussie one) was recently farewelled from the Marist House of Welcome, Paddington, Brisbane. 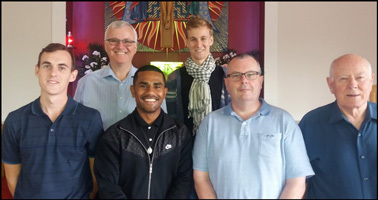 Above, from left: Hayden Powick, Fr Chris Skinner, Seremaia Turagabeci, Hayden Kennedy (with scarf), Fr Pat Breeze (superior) and Fr Tom O'Connor. 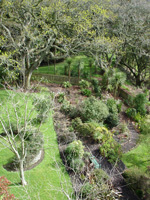 Below: Grounds and chapel, Hopetoun St. 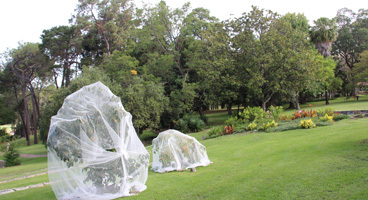 In an effort to protect Villa Maria's annual crop of persimmons from pesky predators, Fr Paul Glynn has enlisted the aid of Bunnings Warehouse and the Japanese Catholic community to fit netting covers over two endangered fruit trees of the historic property. 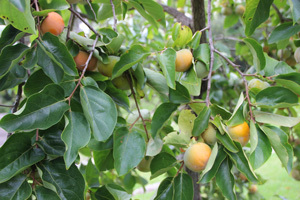 Birds, bats, possums and people are known to pray on the persimmons, forbidden until the appointed time of ripening. All the best, Fr Paul!